One of the biggest challenges related to CT dose reduction has been the development of industry standards. Wide dose fluctuations between types of scans and even among machines in the same department make it difficult to develop protocols that can be widely applied. To aid the process, the ACR has implemented a Dose Index Registry (DIR), part of the National Radiology Data Registry, to collect dose data from participating institutions. The DIR was officially launched in May, and Richard Morin, PhD, FACR, of the Mayo Clinic in Jacksonville, Fla., who is in charge of the registry, is pleased with the response so far. One hundred seventy-five facilities, from small community hospitals to large academic centers, have signed up. So far, the DIR has cataloged more than 100,000 exams and 235,000 individual series. One of the key features of the DIR is that it records dose data automatically; the technologist doesn’t have to do anything. This provides a true accounting of a facility’s dose statistics. Prior dose cataloging efforts used sampling methods to estimate dose because the volume of data is too great for a complete manual accounting. The ACR modified its Transfer of Images and Data (TRIAD) software, which was originally used for ACR Imaging Network studies, to automate the process. The software is currently available as a download, but Morin says there are plans to make it a Web-based service. To participate, facilities designate a PC as their reporting computer and direct their scanners to route structured dose reports through that interface. The TRIAD software anonymizes the data, extracts them from the DICOM header, and sends them to the ACR’s database, where they are automatically uploaded to the registry. To allow all vendors to collect and transmit CT dose information, the ACR worked with Integrating the Healthcare Enterprise to develop a Radiation Exposure Monitoring profile. Morin says a few facilities have had some IT challenges with getting things up and running, and others have had difficulty getting approval from their legal departments because of concerns about leaving a PC on the network 24 hours a day, but most participants haven’t had any problems. He adds that, once a facility is set up for the DIR, it can participate in any of the ACR’s registries, such as the contrast extravasation registry or the virtual colonoscopy registry, without having to sign the registry agreement again. The ACR sends periodic reports to the participating facilities so they can compare their dose values with regional and national values. The immediate goal of the DIR is to provide facilities with concrete data so they can begin to examine their imaging protocols and determine whether those protocols need to be adjusted. This will be an ongoing challenge because there can be significant variations within a facility. Certain types of studies require more exposure than others, and dose can fluctuate depending on a facility’s patient population and the body part that’s being imaged. Morin says facilities also need to be aware that, because facilities use a range of scanners, such as a 4-slice or a 64-slice, there can be notable dose variations among machines, even if those machines perform the same type of scan. 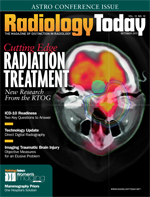 “What we’re hoping, over time, is that the variation, which can be substantial for a given exam—like a head CT without contrast—we’re hoping that that variation will begin to reduce, and people will start to hone in on a value that is an optimal value for radiation dose, given that particular kind of study and the needs that that study has,” says Morin. While facilities can put the data to use immediately, the DIR may open up other avenues for improvement. One area where Morin hopes to see progress is in standardizing exam terminology. The DIR has a tool that allows participating facilities to use terminology that was developed by RSNA’s RadLex group. The tool is designed to be easy to use and require no outside assistance. Morin says the lack of standard terminology creates significant problems across all types of medical information systems, from EMRs to RIS to PACS. Another potential benefit is an automatic body habitus indicator that would not require any intervention from a technologist. The American Association of Physicists in Medicine Task Group and researchers at UCLA and the University of California, Davis have already done work on this tool. Morin says the current body habitus models correlate very well with patient attenuation, and he expects DIR data to aid those models. Eventually, researchers may even be able to design individual organ dose simulations using information contained in report headers. If nothing else, the registry will provide objective data about CT dose. Morin says the ACR will begin issuing public DIR reports this year, and he hopes that down the road the ACR will be able to demonstrate that variance has been reduced among machines as well as over a large population and that the median dose index has decreased. He also envisions other groups, such as the National Academy of Sciences and the National Council on Radiation Protection & Measurements (NCRP), using DIR data for their own reports.